Tuesday, gubernatorial candidate and former Mesa Mayor Scott Smith announced he would race to the border Wednesday in order to meet with Nogales Mayor Arturo Garino. The reason for their meeting? – to hold a joint press conference to discuss the transportation and “dumping” of immigrant children by the Border Patrol in an old refurbished produce warehouse in Nogales. In his statement, Mayor Scott Smith called the Obama Administration’s policy of dumping immigrants in Arizona a “failure of leadership” and “the absolute height of stupidity.” The former Mesa mayor also called for Washington to fix our broken border and immigration system. Smith’s “rush to the border” and his subsequent message following the presser, seem to conflict with his longstanding position on immigration issues and even statements made by Nogales Mayor Garino who was supposedly at the same press conference as Smith. It was Mayor Scott Smith who opposed Arizona’s effort to enforce federal immigration law through the passage of SB1070 in 2010. This is the same mayor who ran into trouble with Sheriff Joe Arpaio when it was discovered that the City of Mesa was contracting with companies who hired illegal immigrants. Apparently, now that Smith is running for higher office, he’s having to finesse his position to attract hard-line anti-immigration voters. A little pandering only goes so far. Well, maybe not so far in Santa Cruz County. While the Obama Administration handed the State of Arizona another election year issue, Scott Smith is only nine days late to weigh in on the crisis. Since it was revealed that DHS and the US Border Patrol began the operation over two weeks ago, Arizona officials have already called for federal action. In fact, last Monday, Congressman Paul Gosar at the urging of Governor Brewer and State Treasurer, Doug Ducey, called for a congressional investigation with the House Oversight and Government Reform Committee into the shipping and detention of immigrants in Arizona. Congressman Darrell Issa, chairman of the committee, has pledged to look into the situation as quickly as possible. Where gubernatorial candidate Scott Smith stands on this issue is anyone’s guess. His opposition to enforcement of immigration law as a mayor tells one story. His support for stronger enforcement as a candidate tells another story. It is an election year after all and finding the right message to appeal to voters is foremost in the mind of most candidates. Let’s hope the voters choose based on proven leadership rather than on finessed messaging. 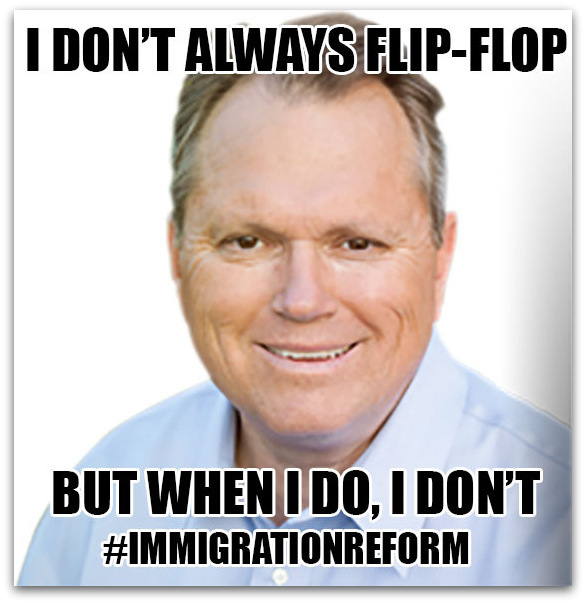 PHOENIX, AZ– On Monday, June 18, Congressman Ben Quayle introduced the “Prohibiting Back-Door Amnesty Act of 2012”. This bill prohibits the Department of Homeland Security from picking winners and losers and blatantly ignoring our laws. Congressman Ben Quayle was the first to introduce legislation to counteract Obama’s immigration edict. He continues to gain attention for his leadership on the issue of immigration enforcement and border security. The immigration enforcement advocacy group “Numbers USA” recently granted Rep. Quayle an ‘A’ grade, ranking him the highest in the Arizona delegation.